Once a year in February, the Shinagawa Yakiimo Terrace is held in Tokyo. This festival celebrates everything sweet potato and showcases new and inventive snacks to enjoy the beloved winter flavor. Roasted sweet potato, or yakiimo in Japanese, is a popular autumn and winter snack in Japan. They are healthy, delicious and easily available during the colder month. Today we will introduce you to an extremely popular yakiimo festival in Tokyo, known as Shinagawa Yakiimo Terrace, and its vast variety of sweet potato snacks that draw in thousands of people every year. Shinagawa Yakiimo terrace had its start in 2018. When asked why they created a sweet potato festival the answer was simply that it's a delicious and healthy snack that is enjoyed by everyone, no matter age or gender. If you ever visited a Japanese supermarket during the colder month you will know that this answer is very true. You see a and ederly woman getting one for a simple afternoon snack while a small child begs his or her mother for yakiimo right beside her. The soft flesh and sweet flavor make it easy to eat and it is also good for you because it is full of vitamins and high in fiber. There are many good reasons why this sweet snack has been popular in Japan for a long time. However, sweet potatoes aren't all equal. Some are sweeter, some are milder, some yellow, some orange and some even purple. To introduce everyone to the great variety of sweet potatoes and the snacks in the same flavor, Shinagawa Yakiimo Terrace was invented. This yakiimo festival is something that can be enjoyed alone or with the whole family. I saw three or even four generations visiting all together and sharing the snacks. There are also a couple of open-air kotatsu(heated tables) to snuggle up under but you have to be very fast to reserve one. DOCO? 's specialty is juicy, fresh sweet potato from Miyazaki roasted in coconut oil. The sweetness of both flavors plays very well together. They also offer Japanese crepes, filled with whipped cream and the same delicious coconut oil roasted sweet potato. Moimoi is located in Chiba. They specialize in rich purple sweet potatoes. 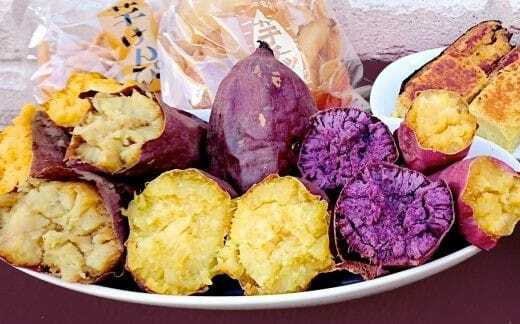 Purple sweet potatoes are unique to Japan and especially popular in Okinawa. They are very flavorful and take on a smoky taste when roasted. Their most unique item is a purple sweet potato latte. It is creamy, not to sweet and has a vivid purple sweet potato flavor and color. OIMO Cafe belongs to a 350-year-old farm which grows sweet potatoes. One of their standout items is sweet potato tempura (battered and fried vegetables) which is created with one of the highest grade sweet potato, also known as the queen of sweet potatoes. Pukupuku started by selling their honeyed sweet potato from a garage every winter. These potatoes are so thickly covered in delicious, sticky honey that they are handed out in a vacuum pack. They also sell sweet potato tea which can be bought in powdered form to take out as well. 5. SAZANKA - King of the "Gold Potato"
SAZANKA has perfected its own kind of sweet potato known as kyokukan, or "gold Potato". It is said to be extremely sweet, juicy and fiber-rich once it is baked. SEADED is located in Shinagawa and became famous for their brule sweet potato they created for the Shinagawa Yakiimo Terrace 2018. The sweet potato is backed with high-quality butter and sugar and develops a burned brule crust. Amendoruya is popular for it's crispy, freshly fried honeyed sweet potato sticks. The cut is extremely fine making them extra crunchy. Besides honey, no additives are added. Perfect to snack on at the yakiiimo festival or to take out. Normally the flesh of sweet potatoes in Japan is yellow, purple or sometimes orange. White-fleshed sweet potatoes are rather rare but recently gain some popularity. They are delicate in flavor and need to be baked very carefully to bring out the best flavor. Yosshi's owner is known as one of the masters of baking white-fleshed sweet potatoes. Higesyouten specializes in growing rare kinds of sweet potato known as "tomitsukaneji" and "nachiguroishi". These are said to be so sweet and juicy that they produce their own kind of "honey" when baked. They are so rare that only a small amount of farmers are able to grow these sucessfully. Kaitsuka is an extremely popular sweet potato shop from Ibaraki. Besides delicious sweet potatoes, known as "red angle", they also offer dried sweet potato snacks which are great for take-out. Yakiimo Koro offers the rare mitsuhime sweet potato which is only grown in Wakayama, Kushimo. It is said to be extremely juicy in texture. The shop offers different snacks with this rare potato. One of the most popular is the sweet potato koroke (Japanese croquette). Igawaya bakes their sweet potatoes with charcoal in special big pottery vessels. This gives them an earthy and slightly smoky flavor. Imoyasu offers a very limited amount of their popular dried sweet potato snack. Only five kilos per day are being sold at Shinagawa Yakiimo Terrace. You are very lucky if you can try it. The flavor of dried sweet potatoes is highly condensed and deliciously sweet. Shio is salt in Japanese, so as the name suggests, this is a slightly salted sweet potato. Normally sweet potatoes are not flavored in any way and in Japan they are rather a sweet snack than a savory one. Shio Yakiimo adds a little bit of high-quality rock salt to bring out the sweetness in their roasted sweet potatoes. Kurata sells a variety of interesting sweet potato items such as sweet potato spread, known as yakiimo butter, sweet potato mont blanc, and sweet potato sticks and chips. They also sell a large variety of all kinds of sweet potatos. Roasted sweet potato is the ultimate winter snack in Japan and if Japanese people like a flavor they often invent an incredible array of versions of it. Shinagawa Yakiimo Terrace has every possibly imaginable version of Yakiimo as well as the simple favorites. The Shinagawa Yakiimo Terrace 2019 is already over but the festival will probably be back in February 2020 with new exciting snacks and old favorites. Why don't you join and find out why everyone loves the sweet and healthy snack so much?